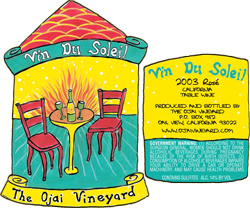 This wine sports our new colorful Vin du Soleil label designed by famous Ojai artist Carmen Abelliera White. The aim of the wine is the same as before; it is a dry Provencal-inspired pink wine, this year made from pinot noir, mourvedre and syrah. Lively and savory, this delicious wine is a great match for surprisingly diverse cuisines.